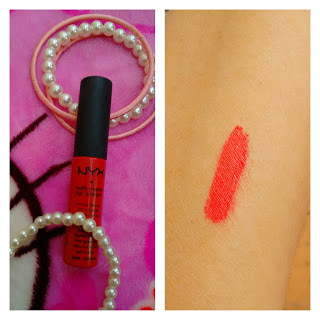 I am going to start off with one of my all time favourite lip colour from NYX. 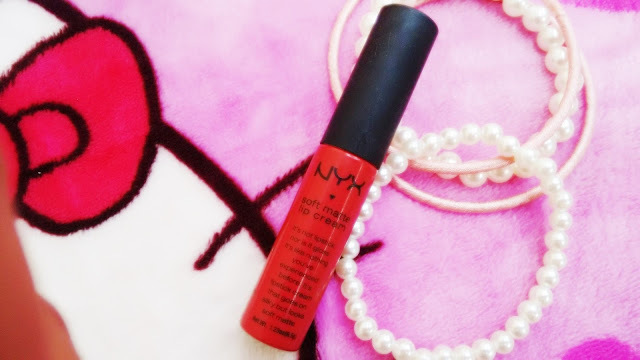 NYX soft matte lip cream in Amsterdam is bright, matte and long staying , read on for more detailed review. NYX lip cream is a very unique lip product, almost like liquid lipstick packaged like a gloss with a sponge tip applicator. 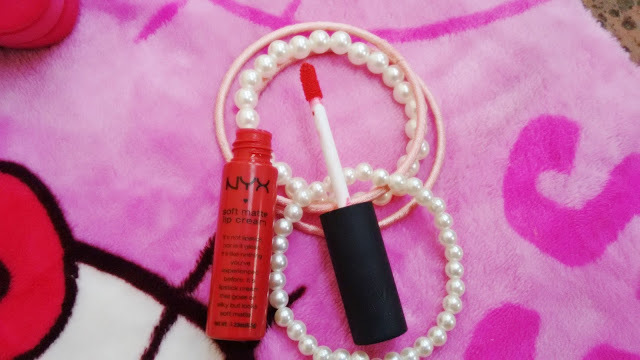 Previously I loved how lip glosses were packed swankily in a slim tube but hated how they were glossy and did not stay for long and then I met lip creams from nyx , it was love at first application. NYX lip cream is soft, creamy and gets applied easily with the sponge applicator. The shade Amsterdam is a Pure, bright and bold red with light orange undertone and will suit most indian skin tones. If red lipsticks are your thing this shade is a must have for you. The finish is matte but it isnt too drying because of its liquid formula but people with dry lips should definitely have a lip balm beneath this lip cream. Two swipes is all i need for opaque colour which will last on my lips for 4 hours even with meals in between and i just love i dont need to use a lip brush for application of a such a bright bold shade. Since the lip colour has a liquid formula i need to wait for like 60 seconds before it dries on my lips to become transfer proof while i get a whiff of light vanilla type of scent. Overall i just cant stop loving this lip cream and the only issue i have with this is its availability in india. Though finding it in india isnt impossible but it isnt available online easily or even at shopperstop or lifestyle counters. I need to repurchase this and cant find this shade anywhere online! If you love mattes and reds got grab from sephora or beautyjoint.com (international shipping).